For over a decade, MetaOption has specialized in developing, implementing and supporting comprehensive ERP and financial solutions that meets the needs of our client’s unique requirements and processes. Our ERP solutions help our private and public sector clients manage critical business processes, increase productivity, and improve collaboration while lowering operational costs. 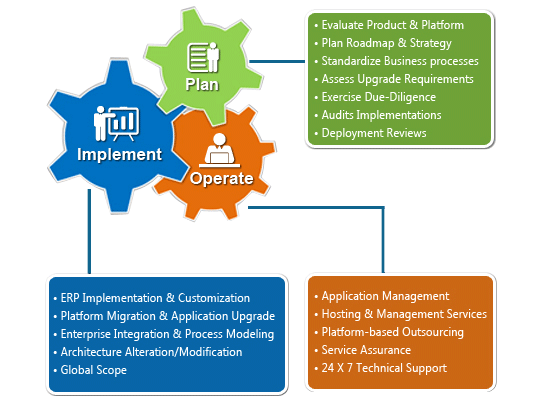 Microsoft Dynamics ERP software consolidates all business operations into one uniform environment and is designed to help your business streamline all aspects of corporate operations from finance and accounting, human resources, payroll, supply chain management, project management, order processing, and more. Dynamics ERP solutions are designed to fit your industry, company size, and budget with built-in flexibility and visibility across your business. Built on familiar Microsoft technologies, this ERP solution is easy to customize and adapt to as your business needs change. This wide range solution integrates with Microsoft Office so its recognized appearance will provide your team with a familiar work environment, work well with your existing systems, empower your people to be more productive, and promote better informed decision making throughout various departments. They go beyond accounting with advanced financial management features. They offer discrete management modules to focus all on all aspects of business. They are quick to implement and easy to customize. They replace the disparate systems with a unified platform. They can be easily scaled up and down as per the current & future needs of the organization. They are true global ERP software solutions with multiple language and currency support. Strong alliance with Microsoft: MetaOption is a Gold Certified Partner of Microsoft that has a strongly knit alliance with the IT giant that helps in delivering the best value to our clients. Extensive experience: MetaOption has been delivering unparalleled Dynamics services in the US since 2005. Certified professionals: MetaOption has a highly professional team of Microsoft certified Dynamics experts, who have immense experience in delivering high-quality Dynamics services. Extensive range of Dynamics services: We offer an extensive range of Microsoft Dynamics services that includes implementation, customization, migration, upgrade, and consultancy services. We are also experts in developing add-ons for Dynamics that help in addressing the unique needs of our client companies. Our focus is to deliver the best Microsoft Dynamics ERP cloud solutions to our clients, at the most economical prices to equip them with a competitive edge to leapfrog their peers.